We offer many options on spending your miles for your next flight. Book your journey and redeem your miles for an award ticket or offer yourself extra comfort by upgrading to Poerava business class. Need more baggage? Why not use your award miles to pay for an extra baggage allowance! 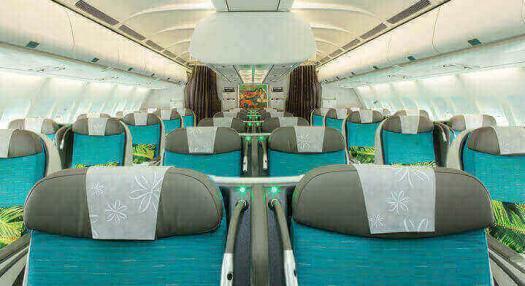 From November 07th, 2018, be the first to travel on the Tahitian Dreamliner between Papeete - Auckland. Request you award ticket in Moana Premium and benefit from the comfort of our new cabin. Book your award ticket online! You can redeem your Miles for a one way or round trip ticket in Moana Economy, Moana Premium* or Poerava Business class on Air Tahiti Nui operating flights. We also offer award options on our code-share flights to France, New Zealand or Australia. Our flights are open 11 months in advance and we have no black outs. However, during the high season, some flights may offer limited availability. If your dates are not flexible, you can choose to spend extra miles for a Comfort award in Moana Economy cabin. What is a comfort award ? you choose to travel. We are offering you a higher booking priority with a comfort award. In this case, your trip will be booked in H class. A standard award and a comfort award can be combined for a round trip ticket. Need to travel on specific dates? All awards are one-way flight awards and must be redeemed on the member’s account. For a roundtrip ticket, multiply the award by two. Roundtrip ticket must be redeemed on one single account. You can request an award online for yourself or a friend or relative. In this case, the amount of miles will be debited from your account. If you don’t have enough miles for your award, you can purchase extra miles online. Before requesting your award ticket, login to your Club Tiare account to purchase your Miles. Your extra Miles will be automatically credited to your account, then you can proceed with your booking. For more information on Miles purchase, go to the BUY MILES section. When issued, your award ticket is valid 12 months from the date of issuance. It is refundable with fees. You can also request a date change to the same destination with a fee. Promotional awards are non refundable, non changeable. Fuel surcharge, airport taxes and other taxes cannot be paid by Miles. You will be requested to pay them separately. We do not charge service fee on award ticket redemption. Some countries have specific entry requirements, we recommend you always check which documents you need to entry and transit to your destination. When there is a combination of multiple award flight segments with Air Tahiti Nui for the same journey, stopovers at the intermediate point are permitted. For more details on the program, please check the Club Tiare general conditions. All awards are one way flight awards. Combination of classes of transportation is permitted. All government taxes, fees and fuel surcharges are payable by passengers. Some of our flights to New Zealand and Paris are operated by partners; our flights between Auckland/Brisbane or Melbourne are operated by our partner Qantas. An award ticket can be booked online. If your miles balance is insufficient you may purchase extra miles beforehand. 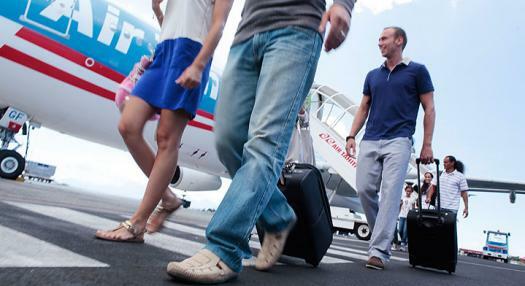 Simply connect to your Club Tiare account on www.airtahitinui.com. * The infant award is deducted only from the Club Tiare account of the member travelling with the child. This award allows the infant to travel without a seat. If a confirmed seat is required, an adult award will apply. You have booked your ticket? Treat yourself with an upgrade to Moana Premium or Poerava Business Class for more comfort. Upgrade award is available exclusively by contacting our reservation center. To ensure a seat in a higher cabin we recommend you request your upgrade award right after your ticket has been issued. You decide last minute? Your upgrade can be easily requested, in person, on day of departure at the airport. Please be aware that upgrade awards are arranged per one-way flight only and are subject to availability on day of travel. If you want to travel round trip in Business Class, we recommend you redeem an award ticket in Business Class or book your upgrade award before your start your journey. An upgrade award can be booked and issued only when the original ticket in the original travelling cabin class. If the upgrade award is requested at the airport on the day of departure, the upgrade award scale applicable will be the LEVEL 2 regardless of the booking class of your ticket. Upgrades cannot be arranged onboard your flight. For all awards, special terms and conditions apply. Check the Club Tiare terms and general conditions before redeeming your miles. When required, fuel surcharge, airport and security taxes are not covered by your miles and must be paid separately at time of award issuance. Service fee is free for our frequent flyer members’ award issuance. 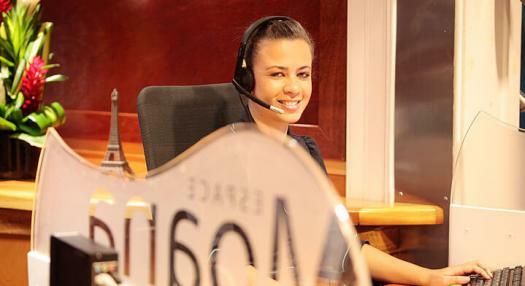 If you need more information, you can speak with someone at the Air Tahiti Nui contact center. From November 07th, 2018, be the first to travel on the Tahitian Dreamliner between Papeete- Auckland. Take benefit from the comfort of our new cabin Moana Premium and Poerava Business. The upgrade award level applicable is determined by the booking class of the ticket and the fare paid. It can be issued only if the ticket in Moana Economy or Moana Premium has been issued. If you choose to purchase your upgrade award at the airport, the level 2 of the scale will be applicable whatever the original ticket’s booking class. * Upgrade award for an infant is deducted from the Club Tiare member's account of the member travelling with the child. This upgrade does not allow the infant to have a confirm seat. Planning to bring an additional or oversized baggage on your next flight? No more worries, bring it all with you! As a Club Tiare member, you can redeem your miles for an extra baggage award whether you are at the entry level Tahia or the highest tier level of the program. Important: If your itinerary includes a connecting flight, you cannot redeem your miles for an extra baggage award. Each airline has its own extra baggage policy; you can purchase an extra baggage for your itinerary on day of departure. The standard baggage allowance for any Air Tahiti Nui flight is 1 piece of 10kg as hand luggage in cabin and 1 piece of checked luggage of 23Kg when travelling in Economy class or 2 pieces of 32kg in Business Class. If you are a Silver or Gold tier level member, you are allowed an extra checked piece of luggage subject to the weight and size allowance of your travelling class. Entry level Tahia members are not allowed to check-in a second piece of luggage for free. Please be aware that extra baggage awards are arranged on Air Tahiti Nui operated flight only and per one-way. If you want extra baggage on your roundtrip we recommend you make arrangements before your departure. Forgot to make the arrangements at time of booking? No problem…you can redeem your miles at the airport on day of departure. After the award is issued, it needs to be used on the flight it has been requested. Refund and change for a different routing is not permitted. For all awards, special terms and conditions apply. Check the Club Tiare terms and general conditions before redeeming your miles. ***Oversize: it is considered oversize when length + width + height are > 158 cm. Award only available at the airport. Extra baggage awards apply only when all flights on your itinerary are operated by Air Tahiti Nui to/from Papeete, Los Angeles, Paris, Auckland and Tokyo. Those awards are not valid when your itinerary includes a codeshare or connecting flight with one of our codeshare or interline partners. If you are in this situation, excess baggage fees will apply from your point of departure to your final destination as long as your connecting flights are on the same TN ticket (TN contract). Redeem your miles and enjoy benefits from our non-airline partners. With a 2 nights stay at the Manava Suite Resort Tahiti and the Manava Beach Resort & Spa, redeem your miles for extra services and other exciting rewards. Enjoy an American breakfast, a bottle of champagne or even a buffet for dinner to make the best of your stay. Nothing easier than redeeming your miles for a reward! Make your reservation with a participating hotel then log in to your Club Tiare account to select your award. Your miles will be debited from your account and a certificate will be sent to you via e-mail. Simply show your certificate on the day of your arrival. Services are available for a minimum of 2 consecutive nights stay. Your stay with the partner must be booked first before redeeming your miles and issuing your certificate. Make sure to advise the partner you will present a Club Tiare voucher for the service booked. After the certificate is issued, miles are non-refundable and non-exchangeable. Special terms and conditions may apply on December 24th and 31st. Hot drink, fruit juices, fruits and pastries 1500 Service available for a minimum 2 consecutive nights stay. Valid for 1 person per room and per stay. Second person will be charged at the public rates. The offer is not applied to group rates, business rates and long stay rates. Starter, main course, dessert 4500 Service available for a minimum 2 consecutive nights stay. Valid for 1 person per suite and per stay. Second person will be charged at the public rates. Blackout dates : No miles redemption is authorized for dinners on December 24th and 31st at both properties Manava Beach Resort & Spa Moorea and Manava Suite Resort Tahiti. 75 cl bottle 7000 Service available for a minimum 2 consecutive nights stay. 1 bottle per room and per stay. 75 cl bottle 2500 Service available for a minimum 2 consecutive nights stay. Hot dishes, hot drinks, fruit juices, fruit and pastries 2000 Service available for a minimum 2 consecutive nights stay. Valid for 1 person per bungalow and per stay. Second person will be charged at the public rates. 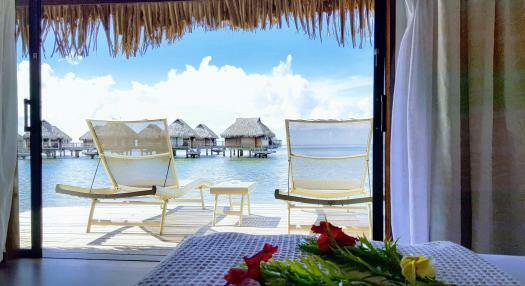 Breakfast for 2 delivered by polynesian canoe to your overwater bungalow. 9000 Service available for a minimum 2 consecutive nights stay. Valid for 2 person per bungalow and per stay. Buffet dinner with Polynesian show (Wednesday or Saturday) 5500 Service available for a minimum 2 consecutive nights stay. 1 bottle per bungalow and per stay. Enjoy gentle but deep sensations with the feel and scent of our authentic oils. Body and mind will be completely relieved 8000 Service available for a minimum 2 consecutive nights stay. Please contact the spa of the hotel, before booking your service on the website of Air Tahiti Nui.The offer is not applied to Group rates, Business rates and Long Stay rates.